The major design challenge here was unifying disparate programs into one facility while maintaining the campus’s intimate scale and rustic character. Windigo Architecture, LLC in Morristown, N.J. has been awarded a 2017 Merit Award for superior design by the New Jersey chapter of the American Institute of Architecture (AIA New Jersey). 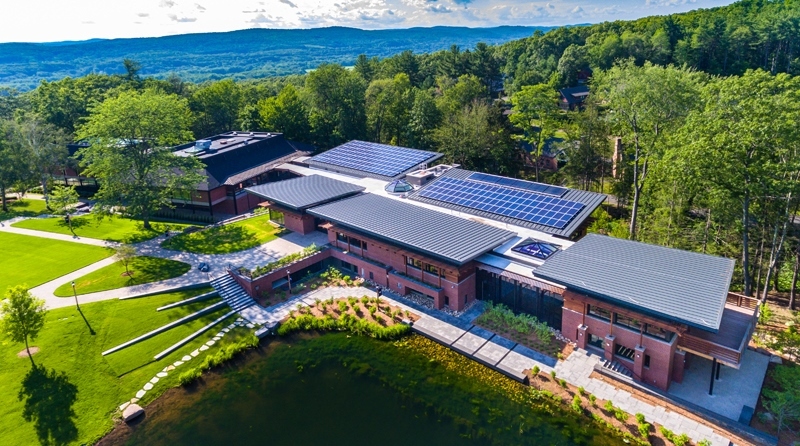 The award was given in the “Built – Commercial, Institutional, Educational or Multi-Family Residential Design” category for the Edward P. Evans Academic Center at Eaglebrook School in Deerfield, Mass. The AIA New Jersey Annual Design Awards Program brings public and professional recognition to architectural projects which exhibit design excellence. Windigo Architecture was among only five architecture firms to be honored in this category; there were 87 total submissions across all categories. The awards will be presented at AIANJ’s awards & installation dinner on January 13, 2018. Windigo Architecture won a second award for a residential project in Connecticut as well. The Evans Center, comprising 40,000 square feet, was conceived as a teaching tool for Eaglebrook’s science, art, and music programs. It opened in October 2016, replacing several outdated buildings on campus. "Since Eaglebrook's founding in 1922, one idea has continued unchanged: the belief that the outdoors is an essential element in educating children and cultivating values,” said Andrew Chase, headmaster of Eaglebrook School. 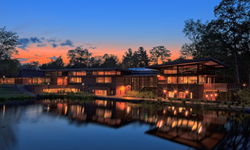 “The Edward P. Evans Academic Center is a remarkable building that captures the natural beauty of Eaglebrook and offers faculty and students new opportunities for teaching and learning." The Windigo team developed a diversity of dramatic spaces meant to encourage an interdisciplinary community between the various departments that share the building. Key design goals were transparency, sustainability, integration with the school’s natural features and invitation to exploration. Learning space moves in and out of the building via ramps, open stairs, bridges, terraces, a green roof and amphitheater. Tilting roofs provide generous natural light and channel rainwater into open spillways leading to the central pond, dramatizing the hydrologic cycle. 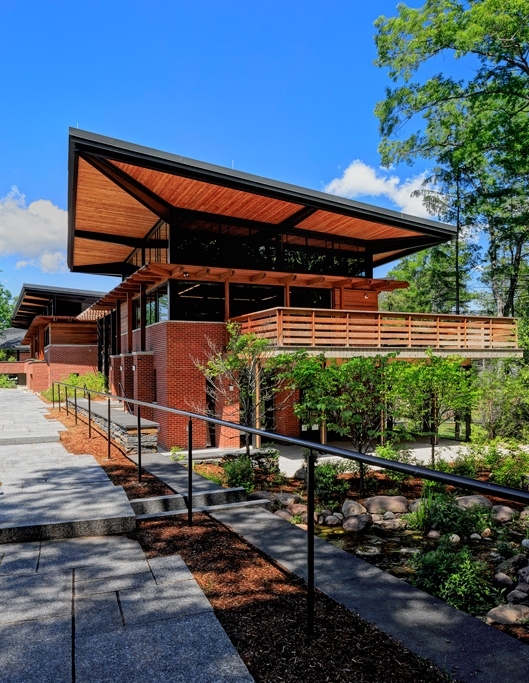 The building’s edges extend outward into the central campus and unite the pond with a great lawn, while providing opportunities for outdoor instruction and play along its edges. The building is clad in brick and wood, with prominent glass curtain walls; these elements connect it to existing structures and the surrounding woodlands. Thirty-two geothermal wells underneath the building heat and cool the interior, and a rooftop solar array provides most of the building’s electrical needs. Exterior wood sunshades and interior sun-shelves modulate seasonal daylight into classrooms, reducing the need for artificial lighting. When needed or at night, warm LED lighting provides a comfortable environment throughout. A member of the U.S. Green Building Council, Windigo Architecture works with many clients to incorporate energy efficiency into projects. For more information or to view a portfolio of completed projects, visit http://www.windigodesign.com.